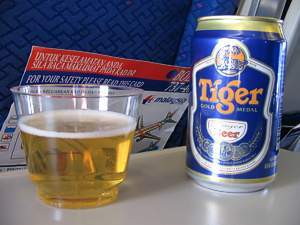 Wine, beer & spirits, are free on all domestic and international flights, including during Ramadan. All wine is in large bottles, and is poured for you. All beer comes in cans which are opened before you get them. Very much a classic French chardonnay from the Burgundy region, even the label gives the game away that this is wine of the old school. A stylish and refined Chardonnay, with subtle toasty aromas and a touch of oak. The flavour is nicely balanced with creamy pineapple fruit and a nutty finish. It has a good nose, and a very strong aftertaste. This wine goes well with the inflight noodles. All beer will be opened for you, unless you ask. There is the same selection of beer in business and in economy. In business you'll get a glass tumbler to put it in. In economy its plastic. This beer is great - full of an intense yet light flavour. It's one of the few beers I can drink on a plane and not get a hangover from. 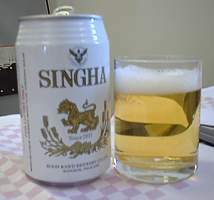 The finest beer made in Thailand. Its the usual selection of hops and malt making lager, which makes a mighty fine beer, and it goes down very smoothly. This creation of the Boon Rawd Brewery Co is much stronger than you may think. 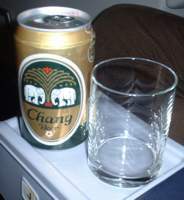 Chang is much heavier than the lightweight Singha. This lager is on the verge of being a bitter. Its the usual dull stuff you get on the ground. On some of the routes you'll be hunting for some of the good stuff from Scotland to make the flight go by. Gelnfiddich does just the job - although getting any ice for it to go with can be a struggle.